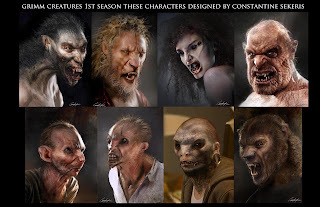 The second season of Grimm starts next Monday (August 13th) at 10/9 c and I decided to contact some of the artists and share designs and stories for the show. "Grimm" is a drama series inspired by the classic Grimm Brothers' Fairy Tales. After Portland Homicide Detective Nick Burkhardt (David Giuntoli, "Turn the Beat Around") discovers he's descended from an elite line of criminal profilers known as "Grimms," he increasingly finds his responsibilities as a detective at odds with his new responsibilities as a "Grimm." First up is Constantine Sekeris (Blade II, The League of Extraordinary Gentlemen, Jarhead). He talked with me about working on the show and the challenges of designing a good balance of creature and humanity. Q: What's it Like Working On Grimm? Its always a lot of fun to work on these creatures because of the theme of the show that has to be retained in the design of the creatures. I’m thankful to be a part of a team on a cool show. I’m very happy that it’s doing so well and audiences like it. Jerad (concept designer Jerad S. Marantz) and I really like to push the design so people can really enjoy the creativity of the team and we help bring their ideas to life from a cool image. I love it each time I get an email from Steve Oster telling me what the next creature I will be challenged with. Q: What Was the Biggest Challenge You Faced On Grimm? My most challenging design was the Bear (Jägerbar) creature it’s hard to take the structure and round shapes with all that fur and bring it into more of a human creature feel so it’s a bit scarier. We had to remove a lot of the hair so it’s not so cute and we had to really be careful that it didn’t look like the werewolves from the show. I think they went with Jerad Marantz take on the character. 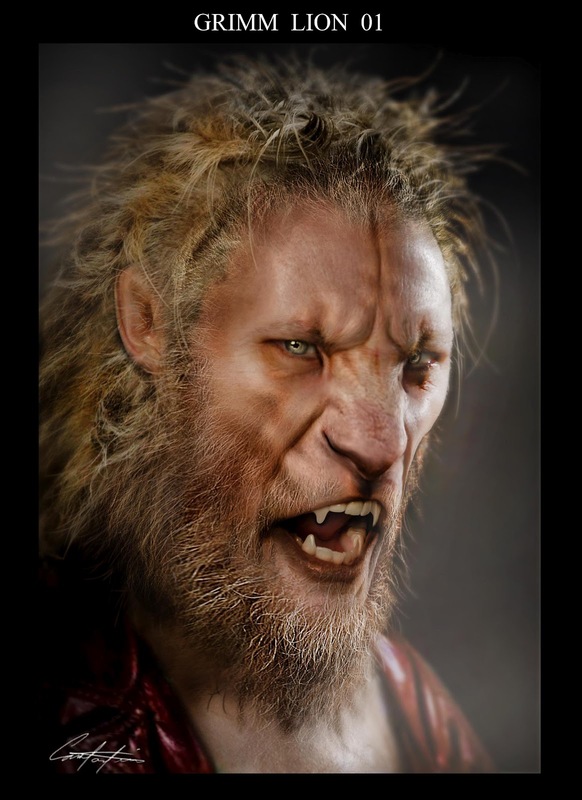 It’s great to have an objective and fresh eye like Steve Oster the main producer on Grimm who helps give tips of what is liked and what changes can be made when we all hit a wall sometimes to make the creatures still have a human quality. There has to be a good balance of creature and humanity for the character to work on the show. Q: How Do You Design Your Creatures? I begin my process with research and rough sketches to explore the best designs for the show and then render a few options that then go through a decision process with the team and then take the final design to finish. So the prosthetic team of Barney Burman and the digital team have enough time to do their best for the show. I can’t wait for the next creature. I would like people to know that I’ve come out with a book called MetamorFX of Constantine Sekeris with Creature, Makeup, Robot and Costume design you can find it on Amazon and Barns & Noble. Thanks for having me apart of your blog. What do you think of the illustrations? Have you seen Grimm? What do you think of the creatures? I think the illustrations stand out as something unique to the show and it's characters. I watched a portion of maybe one episode of Grimm but only because I was in the company of someone who watches that show on a consistent basis. Although the concept of Grimm seems interesting, I just never got into the series. I'm also not a huge fan of creatures but do like the conceptual renderings of the lion, as well as the last creature on the top row. What the artist said about him trying to make sure that they didn't render something that looks like a werewolf, was interesting to read. It's funny how the slightest features can make what is supposed to look like a bear, actually look like something else. That part of your interview where he talks about making it scary, yet also trying to balance the human features simultaneously, had me oddly thinking about Michael Jackson's Thriller video. Go figure! Just started watching this show and I think it is great. Love the monsters!